On the top: Schematic diagram of the high-power Kerr-lens mode-locked Yb:CYA laser by introducing an extra Kerr-medium to separate the gain material and Kerr material. On the bottom: (a) Continuous wave and mode-locked spectra with an inset of the beam profile at the maximum average power of 1.5 W. (b) Measured (black dash) and fitted (red) intensity autocorrelation trace. The generation of high power femtosecond pulses directly from a solid-state laser oscillator is currently one of the frontiers of ultrafast optics, with their extensive applications ranging from nonlinear microscopy to ultrafast spectroscopy as well as from frequency conversion to high-field physics. Shortening the pulse duration generated from the laser diode (LD) pumped all-solid-state Yb-based lasers to less than 100 fs or even 50 fs relies on advanced mode-locking techniques such as passive mode-locking with new saturable absorbers or Kerr-lens mode-locking (KLM). Passive mode-locking faces the challenges of complex absorber preparation, high loss and low damage threshold, which makes it difficult to obtain the sub-100 fs pulse with high power. Traditional KLM falls in serious trouble in enhancing the Kerr nonlinear effect and mode-matching, especially for the LD pumped solid-state lasers. As a result, short pulse generation simultaneously with high average power is very difficult in either case. Researchers from a joint research team of Xidian University, Institute of Physics (CAS), and Jiangsu Normal University proposed a new scheme to generate high power ultrashort femtosecond pulses from LD pumped all-solid-state lasers using a modified KLM method. They separated the laser gain medium and the Kerr medium in a double confocal cavity to release the restrain imposed on the laser crystal which usually acts as double-role of gain medium and Kerr medium. Related results are published in Photonics Research, Volume 6, No. 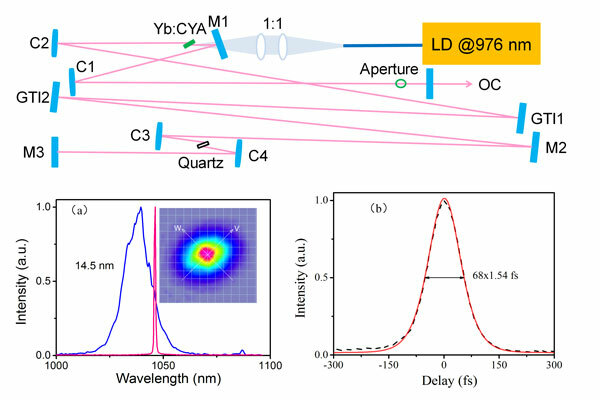 2, 2018 (W. Tian, et al., Diode-pumped power scalable Kerr-lens mode-locked Yb:CYA laser). An extra Kerr medium of 2-mm-thick quartz plate is introduced in the laser cavity. An immediate result is that the laser gain medium, a 2-mm-thick 8-at.% doped Yb:CYA crystal, is no longer necessary to act as the Kerr medium and as a consequence, higher pump power with larger beam spot size is allowed to focus on the laser crystal. At the same time, the beam waist inside the quartz is designed to be small enough to ensure the appropriate Kerr nonlinearity. By doing so, a multi-mode LD pumped high power KLM Yb:CYA laser is demonstrated for the first time (to the best knowledge of the authors). The output power up to 1.5 W is obtained with the pulse duration down to 68 fs. Compared with the traditional single-confocal KLM Yb lasers, the output power has been increased by an order of magnitude, which proves a feasible technique for obtaining short pulses with high average power. Researchers from this team believe that multi-watt power sub-100 fs pulses could be obtained based on this cavity geometry.